I’m ready to get back into J-tin and I love this thing. 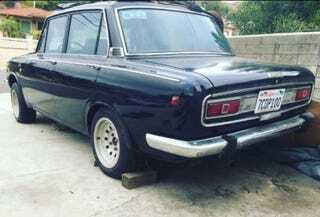 It’s a 1970 Corona, and if my research is correct, it’s the last year of the 1st generation of Toyota sold in the US (also known as Toyopet in Aussieland). It has the 1900 engine (and comes with a spare in the deal, + other parts) with a 2-speed (!) automatic. The auto doesn’t bother me b/c I’m looking for a cruiser since I’ve already got my stick F56 Mini Cooper S.
Guy says everything works and sent me a walkaround vid of it running. Sounds smooth but who knows what it’ll do when I’m actually there. Glass is good, lights are good, doesn’t look like there’s any crazy rust. Interior looks really good, aside from the dash but that still looks serviceable. Also has A/C, but I don’t know if that works or not. So what do I do? Guy wants $3900 but has been sitting on it for a while and is willing to negotiate. I want to keep it under 3k and going to offer $2500 to start. So what say you, Oppo? NP or CP?